Welcome to Point Counter Point, wherein Derek vents his spleen like the dour misanthrope we've all come to know and love, Dieter consoles us all with rainbows and unicorns, and the truth lies - as it always does - somewhere in the middle. Today's topic: What to make of all the pie-in-the-sky future talk we are hearing from HP instead of actual product announcements. Since HP took over Palm one month ago, the company’s executives have been hitting the interview and presentation circuit on television, print media, and all across the internet. From head honcho CEO Mark Hurd to CTO of Gaming Rahul Sood to CTO of Personal Systems Phil McKinney, they’ve been out and about pumping the media and desperate webOS users and fans with what amounts to rhetorical vaporware. Okay, so maybe that's a bit harsh. I fully understand that there are immense challenges involved in integrating a spunky company like Palm into the monolith that is HP (the world’s largest tech company, for the record). Heck, there are immense challenges involved in just running either of the two companies, let alone what it’ll take to make them one. But we’re a month into the acquisition, which was announced three months ago. I also understand that there's only so much HP can do while the engineering work is going on behind the scenes in Sunnyvale and Palo Alto. Palm obviously had to have at least a few somethings in progress in the R&D department when HP came riding in on the white horse with saddlebacks full of Franklins. With the Pre a year and a half old (released for a year) when the buy-out was announced, I have little doubt that Palm had a successor device ready, or at least almost ready, to ship out the door. They know as well as we do that the modern flagship release cycle isn’t the 2-3 years of the Palm OS days. It’s annual, and shorter for companies not named after fruit. We know Palm didn’t have the money to push out another large device release. They pretty much told us that when they said that they were going to focus on selling the million+ Pre and Pixi devices still in inventory. But now they do have the money; HP forked over $1.2 billion for the company alone, they’ve got plenty more in the bank to launch new product. Did they decide that whatever Palm had in the works wasn’t ready enough (especially in the face of recent Android phones and the iPhone 4) and sent them back to the drawing table? Maybe, we don’t know, but the relative closed-lippedness is starting to get old. Scratch that, closed-lippedness isn’t the issue. I don’t have a problem with product development secrecy. It’s made covering Palm quite enjoyable; we really had no clue what to expect at most press events. Pretty much every announcement from Palm since CES 2009 has caught us off guard in one way or another. The tightness and secrecy is astounding, and somewhat invigorating compared to ye olde days. Flexible displays are cool, we get it, but we all know they’re literally years from being feasible in consumer electronics. What’s frustrating is the vague future-talk from these HP execs. Flexible displays are cool, we get it, but we all know they’re literally years from being feasible in consumer electronics. Tablets are also cool, but vague speak of building an ecosystem of phones and netbooks and tablets and printers all running webOS means very little without any details. So enough of this blogger tirade, eh? What does Derek want? 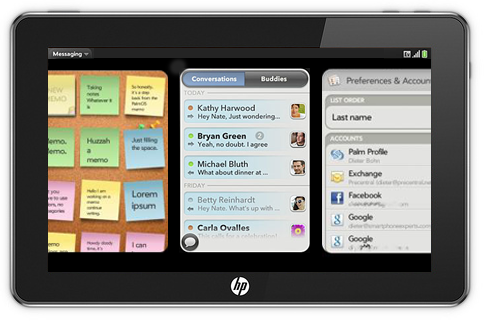 I want HP to look at how Palm conducted themselves before the buyout. Upcoming products weren't discussed, or so much as hinted at. The best we ever got was a passing mention of "multiple form factors" or something like that. There was no trotting out flexible displays, no "imagine this" talk unless it led up to revealing the product we were being asked to imagine. It's a simple message for the execs at HP: Enough. Enough of the wallowing in the middle of not saying anything or saying everything. We’re all desperate for info about what you’re planning on doing with all the resources you got when you bought Palm. You know we are. But either tell us or don’t tell us. Vague hints and talk of out-of-reach technology are frustrating to those of us that want more info and know better (the readers of this site), and confusing and possibly off-putting to those who are casually interested (the majority of webOS users). Here’s the deal: we want info. webOS users want to know what’s coming next because we’re looking at the current crop of smartphones, with newer and better devices (at least from the hardware standpoint) coming out every week, and we’re getting desperate and antsy. If anything, the Pre Plus’s extra RAM and the various overclocking kernels available have proven that what webOS needs more than a software update (which it does need) is better hardware. Here’s what it boils down to: for the sanity of the webOS userbase, please stop toying with us. Stop being coy, stop trotting out technologies and concepts that are years from fruition. I know it's not intentional - it's what you've been doing for years when talking about printers and desktops and laptops. And it works for those products - but half of the mobile devices game is presentation. It's about wowing people with the unexpected. You can blame Apple for that, but it's worked quite well for them. Talking about vision and strategy mean little when you don't talk about what that really means. Connected devices with uniform interfaces are great, but tell me how that's going to change my life. I know it's not actually going to change my life (if it does, so much the better), but I at least need you to try and convince me. What made the presentations by Palm and Apple so awesome was that they showed me how this or that was going to fit into my life. Vision doesn't fit into my life, nor does strategy. All this talk is wearing on my jaded Palm fan nerves. HP, I love you, but the honeymoon is over. It’s time to get down to business. Counter-Point: It's HP's culture, get used to it. Maybe it's a product of my long, long history covering all things Palm, but this quiet period in the desert of product announcements seems relatively short and painless compared to the long, long wait we had before webOS. It's true, we are now in a new era of smartphones where any product release cycle longer than a year is essentially unacceptable - and if you count the 2009 CES announcement of the original Palm Pre then we are in that territory. So: granted. This quiet period in the desert of product announcements seems relatively short and painless compared to the long, long wait we had before webOS. But playing devil's advocate here, it's pretty clear that HP and Palm have been trying to tell us as much as they can without making actual product announcements: we have learned that slates, printers (ahem), new smartphones, and even webOS 2.0 are all in the pipeline. So wither the actual product announcements? Let's assume (if only for the sake of our own sanity) that we won't be waiting until 2011 for a new webOS phone. We have learned from hard experience that the length of time between product announcement and product launch should be as short as possible. If Palm has a smartphone coming, it's in their best interest to announce the thing fairly close to release. HP and Palm simply must be aware that we've stopped waiting with bated breath for new hardware and instead have exhaled and passed into exasperation, so they feel the need to tell ussomething, unfortunately that something is light on details and lighter on timelines (excepting the promise of webOS 2.0 by the end of the year). In that context, talking about the possibilities of technology as a way of building up a company's brand makes more sense. The question on the table, then, is this: if you can't say anything nice, should you say anything at all? In the gadget world, the answer is generally "no." HP, though, is not of the gadget world. They're of the PC, printer, and enterprise world. I could be wrong, but I don't think there are many people frothing at the mouth at consumer-level printer rumors these days, nor do enterprise customers put much stock in grainy spy-shots of the next server hardware. In that context, talking about the possibilities of technology as a way of building up a company's brand makes more sense. More to the point, HP has a long history of talking about blue-sky futures and creating an ethos of research and innovation that leads to those futures. They're not shy about talking about that research, either. Peruse HP's Data Central Blog (skip past the Hurd announcement) and you'll see plenty of examples of how HP casts a wider net when it comes to what they discuss in the technology space: influential tweets, information as asset, and even a Central Nervous System for the Earth. So while hearing about technology that's years away from consumer availability can be frustrating, it's important to remember that we may be too attuned to the typical gadget rumor cycle where FCC slip-ups and carrier testing portends technology that's weeks or months away from consumer availability. It's actually rather exciting to know Palm is now part of a company that is looking into flexible displays, augmented-reality gaming, and crazier tech they haven't talked about yet. I don't see this talk as a replacement for real product news, of course. Soon (I hope!) we'll have product news with a expected timeline of months rather than years. In the meantime, get used to the fact that the cats at HP are so excited about future tech that they can't help sharing.